U.S. Supreme Court Justice John Paul Stevens denied a request by former Illinois Governor Rod Blagojevich to delay his June 3 corruption trial. Blagojevich had sought a delay until the high court ruled on unrelated cases challenging the federal honest-services fraud law. The justice’s ruling was announced by the court’s public information office. No written decision was issued. The “tax-amnesty” bill (SB377) is expected to raise $250 million from tax scofflaws who might otherwise never pay. The deal is that, as long as they pay before Nov. 8, they get out of the usual fines. The bill now goes to Democratic Gov. Pat Quinn — who, of course, is looking for every dime these days. The bill passed almost unanimously, with just one “no” vote: Sen. Bill Brady, R-Bloomington, the Republican nominee for governor and Quinn’s election opponent in November. We haven’t yet been able to ask Brady about his opposition. Other opponents have generally complained that the measure rewards people who have failed to pay their taxes, letting them off the hook for fines they should pay, while not offering anything to taxpayers who’ve paid on time. There may be at least two reasons besides the gubernatorial candidate’s issue stance and the political season for that “No” vote. The first, of course, is the fact that Brady didn’t pay state income taxes in 2008, as well as asking for and receiving a $1,616 refund. The second is that Brady’s tax returns showed he underpaid his federal income taxes by $137,800 and paid a $4,388 penalty in 2004. The Illinois Senate on Thursday endorsed a taxpayer-backed retail development that supporters say will bring thousands of jobs to Southern Illinois. The proposal, approved on a 34-17 vote, would use sales tax receipts to subsidize Swansea developer Bruce Holland’s plans for a “destination development” on 400-acres in Marion. The bill on Quinn’s desk was written by the coin machine industry’s lobbyists and hustled through the legislature with no input from state regulators or the public. Nothing good ever comes of that. The Gaming Board’s staff long ago signed off on the bill when approached by gaming lobbyists. The proposal had public hearings in both chambers, which the Gaming Board and gaming opponents attended and testified to. The National Restaurant Assn., which wrapped up its annual show Tuesday with more than 58,000 attending, is among those that have considered leaving. The NRA, which had the fourth-largest show in Chicago last year, saw a 6% increase in attendance this year. * As you know, I vowed not to cut my hair or trim my beard until the General Assembly adjourned for the summer. Since the session doesn’t appear to be over, do you think I should ignore my wife, loved ones and friends and keep the promise? Or should I go ahead and cut and trim? As always, explain your answer, please. 1) Illinois’ unemployment rate has tracked closely with, but has always hovered above the national rate for decades. Most of us who watch this stuff already know that, but too many people don’t. This has always been a problem here and it’s mainly because we’ve relied so much on manufacturing. During the 1980s, many of those jobs moved to the non-union South. In the 1990s, they went to Mexico. Now, they’re going to China, although a friend of mine is losing his factory job soon because the plant is moving to Mexico. Closely tracked, but always above. This is the way it’s always been here. 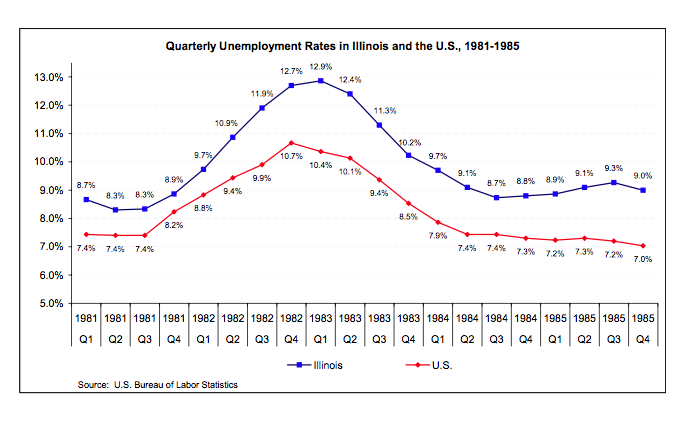 In January 1983, Illinois was in the depths of a severe recession. Unemployment in the state had reached 12.9 percent, substantially higher than the current rate of 11.5 percent. Nonetheless, the General Assembly and the Governor instituted a temporary 18-month income tax increase to bolster state revenues. The individual income tax was raised from 2.5 percent to 3 percent and the corporate income tax from 4 percent to 4.8 percent. During the first quarter of 1983, the state’s unemployment rate was 12.9 percent, up from 8.3 percent in mid-1981. By the third quarter of 1984, after the income tax surcharge had expired, unemployment had fallen to 8.7 percent — a drop of more than 4 percentage points. Over the same period of time, nation-wide unemployment declined from 10.4 percent to 7.4 percent. The unemployment rate in the Chicago metropolitan area continued to improve in April, falling to 10.7 percent from 11.2 percent in March, the Illinois Department of Employment Security reported today. The rate was up from 9.8 percent in April 2009 and was above year-ago levels in all 12 metropolitan areas for the 35th straight month, but the increases have been consistently smaller in each of the four most recent months, IDES said. The rate was 11.3 percent in February. The Chicago metropolitan area lost 84,500 jobs last month from a year earlier. Are they gonna win it all or what? …Adding… The full video is here. On what could be the final legislative day until November, Gov. Quinn’s bid to borrow $3.7 billion to pay for state pensions stalled in the Senate, where GOP gubernatorial nominee Bill Brady and fellow Republicans withheld support. “We’ve been able to stave off more pension borrowing on the backs of our children and grandchildren,” said Brady, of Bloomington. Skipping a pension payment costs much more than borrowing. If the state skips, it could lose at least $20 billion in investment income over 20 years. Borrowing $3.7 billion now would cost about $1 billion. We urge the Republicans and the two wayward Democrats who don’t support pension borrowing to mull over this simple math for the next two weeks. [Democratic Sen. Heather Steans] said she may be able to support a smaller borrowing effort if it was part of a budget package that also included more spending cuts and a way to raise revenue, such as an income tax increase. Yeah. An income tax hike in a year like this. That’ll happen. Their political party before their state. Their Republican colleagues before their constituents. The leader of their caucus before the taxpayers. Those were the choices state Reps. Raymond Poe, R-Springfield, and Rich Brauer, R-Petersburg, made on Tuesday night. Poe and Brauer voted against a plan to borrow $3.7 billion to make the state’s full payment, on time, to the pension systems. Consider Tuesday’s vote on a borrowing plan. Two Republicans were said to have “broken ranks” because they voted with the Democratic majority to approve the proposal. Republican state party chairman Pat Brady almost seemed more concerned that Rep. Bob Biggins, R-Elmhurst, missed a Republican caucus meeting than the fact that Biggins was one of only two Republicans who voted for the borrowing plan. State Rep. Bill Black, R-Danville, was the other. Does anyone think it was a coincidence that the two Republicans who voted in favor of the plan aren’t up for re-election? But other options may exist. Part of the emergency budget powers granted to Quinn allow him to tap surpluses in special state accounts to cover state spending, though the money must be paid back within 18 months with 1 percent interest. Quinn already proposed borrowing $1 billion from those accounts, but lawmakers didn’t limit how much he could take so long as it doesn’t impede the cause or effort for which the account was created. The Senate’s budget pointman said upward of $3 billion might be available for the governor’s use. A far more serious breach that deserves immediate investigation is Brady’s repeated votes on legislation that served to financially benefit himself and his business interests. Senator Brady can’t possibly claim he didn’t know there was a conflict of interest. They couldn’t have done that on Sunday or Monday? Sheesh. Gubernatorial candidate Bill Brady is calling for an investigation into Governor Pat Quinn’s acceptance of $75,000 in campaign cash from the Teamsters Union just before his amendatory veto on McCormick Place that would have benefitted the union. “It’s appears to be another shameful example of pay-to-play politics,” Brady said. “The people of Illinois deserve a thorough investigation.” Brady will ask Attorney General Lisa Madigan to begin the investigation. I’ve been wondering all week why Gov. Quinn’s campaign has all but ignored an explosive but little-noticed story. Quinn has been silent about the revelation that his Republican opponent Bill Brady had voted for three different bills that directly helped his struggling real estate company develop a project in Champaign. The area that Brady was developing had no sewer system, and Champaign was having trouble buying the property easements to lay pipe, so the town asked the General Assembly to give it “quick take” powers that would allow them to seize the land for a fair price. A very high-level Democrat who is often the target of media investigations told me the other day that he would be sent to prison if he voted to directly benefit his own business. It’s one thing if, say, a farmer votes for a bill backed by the Illinois Farm Bureau that would help lots of farmers throughout the state. It’s quite another thing if that same farmer voted for a bill which helped only himself. This ought to be big news, and it’s full of rich targets for campaign press releases. “Brady voted to pad his own pockets,” is one hit that springs to mind. The “sewer” stuff writes itself. The same guy who didn’t pay federal income taxes for two straight years was involved in a project subsidized in part by federal funds. But Quinn’s campaign didn’t take the bait. He should’ve done something, because now the governor has found himself on the defensive. Last year right about this time, Quinn got into trouble when it was revealed that a campaign staffer was asking lobbyists to set up fund-raisers. This happened near the scheduled end of the spring legislative session, so all of those lobbyists had bills awaiting the governor’s signature or veto. The lobbyists leaked the story, and Quinn was forced to apologize. He vowed not to do any more fund-raising until after the session was over. Apparently, that promise didn’t apply to this year’s spring session. On Thursday, my buddy Greg Hinz at Crain’s Chicago Business broke the story that the governor had received some very large campaign checks — totaling $75,000 — from the Teamsters Union in late April. At the time, the Teamsters were fighting legislative attempts to change McCormick Place’s union work rules. The work-rule changes remained in the McPier reform bill that passed both chambers, and the Teamsters were furious. They threatened to sue to block the changes. Not coincidentally, Quinn has been saying that he was worried that the bill would prompt lawsuits. Quinn eventually decided to slap the bill with an amendatory veto. Buried within the text was a provision that killed off a small McPier union and handed its members to the Teamsters. Think of it as a consolation prize. The Legislature voted to override Quinn’s veto Thursday. Quinn alienated every public employee union in the state last month when he signed a pension reform bill into law. Those unions contribute millions of dollars to campaigns, and they’re not giving him any money now. He couldn’t afford to also alienate the big unions at McPier. So, it was pretty much a given that his amendatory veto was pure politics. What we didn’t know at the time, however, was that Quinn had already taken a large pile of cash from the Teamsters. When Quinn got into that fund-raising trouble last year, Brady almost immediately called on Attorney General Lisa Madigan to investigate. Maybe she ought to take a look at both of them. And call me paranoid, but I can’t help but wonder if that’s why Quinn has been so strangely silent about his opponent’s serious ethical lapse. Only a month before Gov. Pat Quinn rewrote legislation to help the Teamsters at the McCormick Place convention center, the labor group gave the Democratic governor $75,000 in political donations, his campaign acknowledged Thursday. You have to read 25 grafs into the piece before you find the Brady bills stuff. Sure makes you wonder why the two stories are so different. * Sen. Brady held his own presser last night and went to work on Gov. Quinn for the McPier amendatory veto and the Democrats for trying to borrow the $3.7 billion pension payment. Reporters also tried to get the Bloomington Republican to reveal more details of where he would cut from the budget. Brady again stressed his belief the state could save a good chunk of change by auditing the Medicaid system. The presser is below in three parts. The department called the trend toward month-to-month declines a significant sign of an improving job market. Through the first four months of the year, the state has added 51,000 jobs compared to the same period of 2009. Ameren Corp. plans to ask state regulators Friday for another hearing on its request for higher electric and natural-gas delivery rates after the original $130 million proposal was cut to $10 million. At the same time, the company announced Thursday that it will pass cheaper wholesale electric costs on to Illinois customers June 1. A typical residential customer who uses 10,000 kilowatt-hours of electricity a year will save approximately $68, or about 6 percent on their total annual bill for electricity, said Johnson. Bombardier, the Pennsylvania manufacturer of the L cars, has been working on a modification tol improve the brakes, according to the CTA, which said the trains haven’t experienced any brake failures but that, under certain conditions a component was found to be affected by vibrations, whch the transit agency said could, over time result in a loss of braking friction. Just 500 votes separated CTU President Marilyn Stewart from her toughest challenger in last Friday’s election. More than 19,000 teachers cast ballots. Stewart didn’t get enough votes to avoid a runoff. Last night, third place finisher Deborah Lynch announced she’s throwing her support behind challenger Karen Lewis. The fourth place finisher has also endorsed Lewis. * I went to bed last night with a toothache and woke up with half my face swollen up. Not good. So, I’m gonna get me some medical attention. Barton will put up Morning Shorts and some videos. I’ll be back later. *** UPDATE *** Strong antibiotics and pain killers were prescribed and now I’m back to work. Sorry for the delay, and particular apologies to subscribers for not publishing something today. I was a little freaked out when I woke up and saw my face was all swollen, and I’m usually not easily freaked.